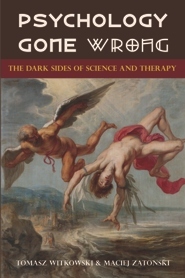 Psychology Gone Wrong: The Dark Sides of Science and Therapy explores the dark sides of psychology, the science that penetrates almost every area of our lives. It must be read by everyone who has an interest in psychology, by all those who are studying or intend to study psychology, and by present and potential clients of psychotherapists. This book will tell you which parts of psychology are supported by scientific evidence, and which parts are simply castles built on sand. This is the first book which comprehensively covers all mistakes, frauds and abuses of academic psychology, psychotherapy, and psycho-business. The second volume was published under the title Psychology Led Astray Cargo Cult in Science and Therapy, also released by BrownWalker Press. "Forbidden Psychology is a powerful and forceful effort to expose dangerous ideas in psychology that mascaraed as science. Readers who care about the problem of pseudoscience in psychology will love this book. And those who don't care really need to read it." "Do you need a therapist? Are you convinced there's something wrong with you and a wonderful new kind of psychotherapy will help - or that an ancient technique revealed for the first time will transform your life? If so, buy this informative and alarming book instead. 'Psychology Gone wrong' reveals the muddles, motivations and even the outright frauds that mean much of the popular psychology we consume is meaningless - and may even be harmful." "In this engaging and informative book, Tomasz Witkowski and Maciej Zatonski courageously take on the "dark side" of psychology, both within the hallowed halls of the academic world and the private walls of the psychotherapy room. In doing so, they expose the often neglected features of contemporary psychology that themselves require treatment. In this respect, their book is a helpful and much needed roadmap for forging a scientific psychology in the 21st century." "I highly recommend this thoughtful and stimulating book to all. Not only should it be required reading for every psychologist and psychology student, but readers in general will benefit immensely as well, especially those who may be contemplating psychotherapeutic treatment. Its purview is broad, ranging from a penetrating examination of fundamental problems that plague academic psychological research to a critical analysis of the psychotherapy jungle, where pseudoscience thrives amongst the plethora of theories and practices offered to the public." "This is a well-referenced, well-reasoned book that is chock-full of information about the state of psychology today. It exposes a lot of dirty linen that would be of interest to any reader. I agree with James Alcock, Professor of Psychology at York University, whose back-cover blurb says it should be required reading for every psychologist and psychology student and anyone contemplating psychotherapy." "The authors are hard on various developments in psychology. It is their concern to clean the 'science house' of psychology. Thus, the book can also be understood as a declaration of their love to science." "For professional psychologists, students and anyone who needs a working knowledge of academic and applied psychology (which includes all skeptics) this is an important book and I thoroughly recommend it." "The fact ofnaming and pointing out the pseudoscientific nonsense, exposing the sterilityof many theories and psychological practices, weighing the rationale forexistence of conceptions that led to creation of cultural and academic demons,showing the mechanisms of psychobusiness and its impact on gullible peopledesperately seeking help - all those things must expose Witkowski to jointcontempt of the powerful caste of priests of pseudoscientific religion thatemerged among more than a few areas of psychology. Author's undertaking and his passionate work reaches far above the simple classificationand description of the current state of affairs. He does not only look at thecurrent psychological resources but also throws away everything that stronglysmells of scientific nonsense or intellectual baloney." "This book is well worth reading by all those who appreciate the skeptical attitude and want to develop critical thinking skills - such important in today's world flooded with informational noise and bombarding our brains from all sides. The book describes detailed analysis of abuses, dishonesties and frauds in some areas of psychology and related areas. This is not a book for psychologists only, it is a book for everybody who wants to progress their scientific thinking. There can never be enough skepticism and criticism." "The author had a simple goal that required enormous knowledge and determination: to reveal the areas of psychology and psychotherapy that promise results that can never be delivered. Witkowski wants to dismantle false claims and show that despite the abundance of pseudoscientific theories, increasing numbers of tinhorns and constant challenges to science - psychology remains a sound knowledge on human's behavior. (...) Such books are rare - publications that help to distinguish fraudsters from genuine therapists. It's reassuring that Tomasz Witkowski does not stop in his crusade against superstitions and stands for those who consider psychotherapy and for the good name of psychology as a science." "You might choose to agree of disagree with Tomasz Witkowski, but you cannot choose to ignore him. This book is definitely worth reading carefully! Enfant terrible of Polish social sciences devoted this entire volume to contemplate the miserable condition of psychology." Dr. Tomasz Witkowski is a psychologist and science writer. He is the founder of the Polish Skeptics Club and specializes in debunking pseudoscience, particularly in the field of psychology, psychotherapy, and diagnosis. He is the author of numerous books dozens of scientific papers and over 100 popular articles (some of them are published in Skeptical Inquirer). As an expert in science-pseudoscience issues, he is frequently called by the media to comment on frauds and abuses witnessed in psychology, psychotherapy and other areas of scientific activity. In 2010 he was awarded Rationalist of the Year in Poland. Dr. Maciej Zatonski is a surgeon and researcher, known for debunking unscientific therapies and claims in clinical medicine. He is actively involved in encouraging people to trust in scientifically proven therapies rather than trusting fairies, myths, and tricksters. He is also a founder of the Polish Skeptics Club and a leader in public understanding of science in Poland. His struggles to clean up medical curricula from obsolete or bogus therapies was recently noted by the Polish Academy of Sciences. Zatonski is also known for promoting evolution and evolutionary sciences. He is an author of over 30 scientific papers, and over 40 popular science articles.